I hate being sick! Maybe because I’ve been off sick so much in the last years that I always feel like missing something vital. When I woke up yesterday morning I couldn’t breath and had a headache. I felt a little faint and when I got up my head was spinning. I had no option but to stay at home. So I made the best out of it and went back to sleep for another 2,5h. When I finally got up I dragged myself to the couch and spend an hour blogging/ commenting on blogs. I was not really hungry or had a good appetite but I felt I needed breakfast. 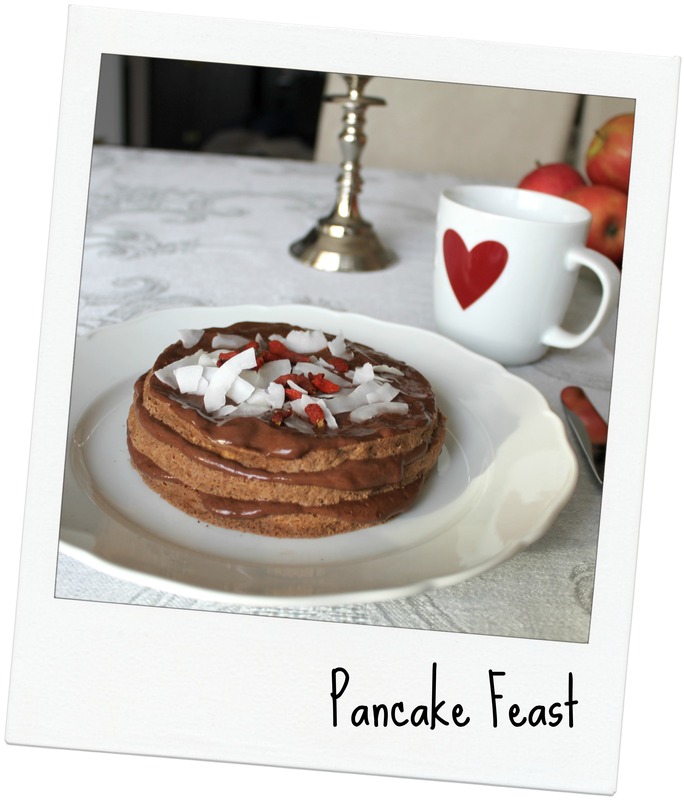 So I approached the kitchen and made a batch of banana pancakes which I piled up and filled with a creme out of cacao powder and soy yoghurt. I topped the tower with some shredded coconut and goji berries. The perfect breakfast for a day off sick. After the pancake feast I wasn’t hungry for the entire morning anymore. So when my stomach started to tell me it was time for food we’d passed 2pm. I needed something quick, fresh and satisfying. 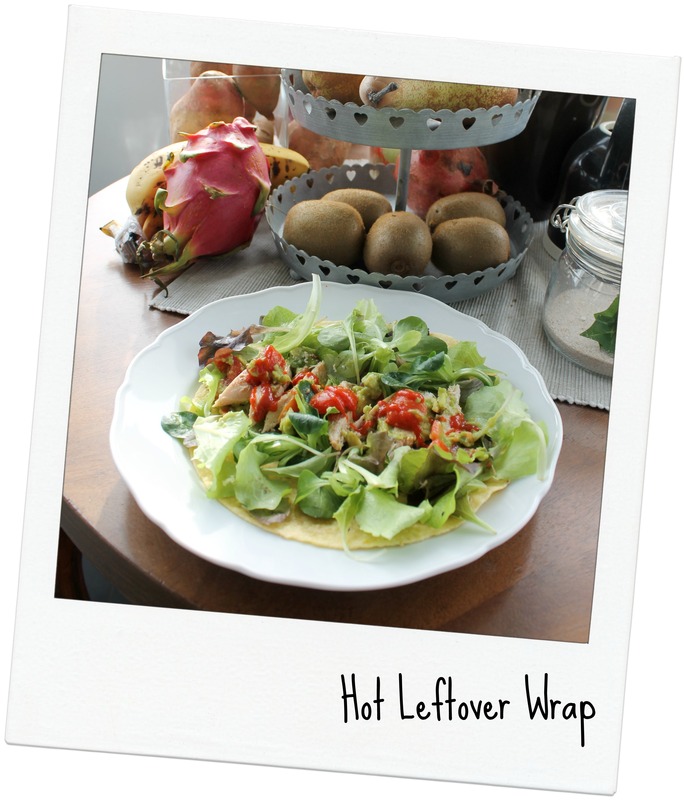 So I made my way through the fridge and came up with a corn flour tortilla filled with lettuce, roasted chicken breast and guac. On top came a holy lot of sriracha. Hot is something I can taste at the moment and helps me breathing. As a dessert I enjoyed a cup of coffee and the last vegan bar. I am obsessed with them and have to make them again soon. Unfortunately the ingredient are darn expensive! But in the end still cheaper than any bar you get in the shops. After some data analysis I thought some vitamines would be good against the cold. So I put out the juicer and started juicing! 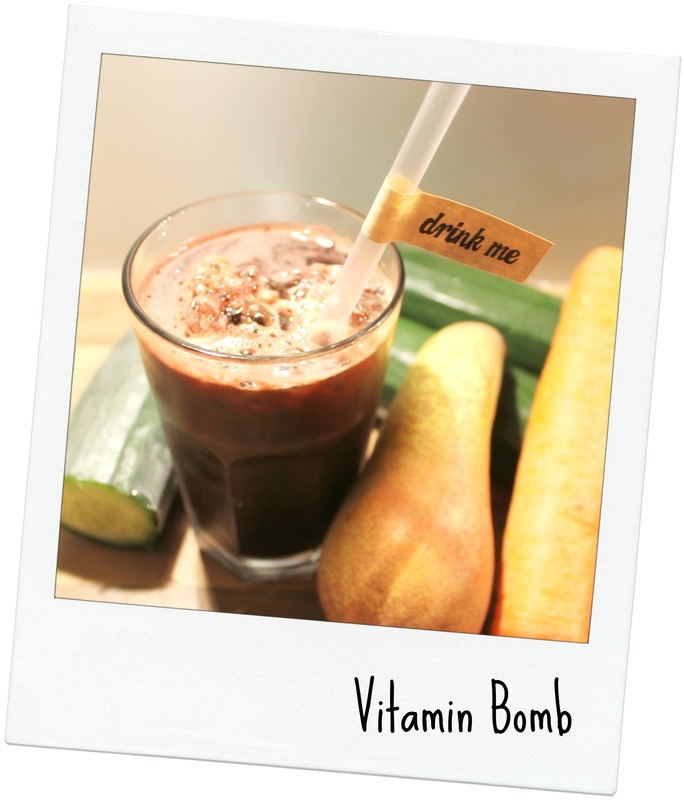 Spinach, beet root, pear, ginger, fennel, cucumber and carrots. After that vitamin party I should be healthy as a horse in no time! The afternoon passed really quickly. When I really get in a concentrated working mode I don’t realize anything besides my work. Unfortunately it takes ages and needs some time pressure for me to come there. Too soon it was time for supper. 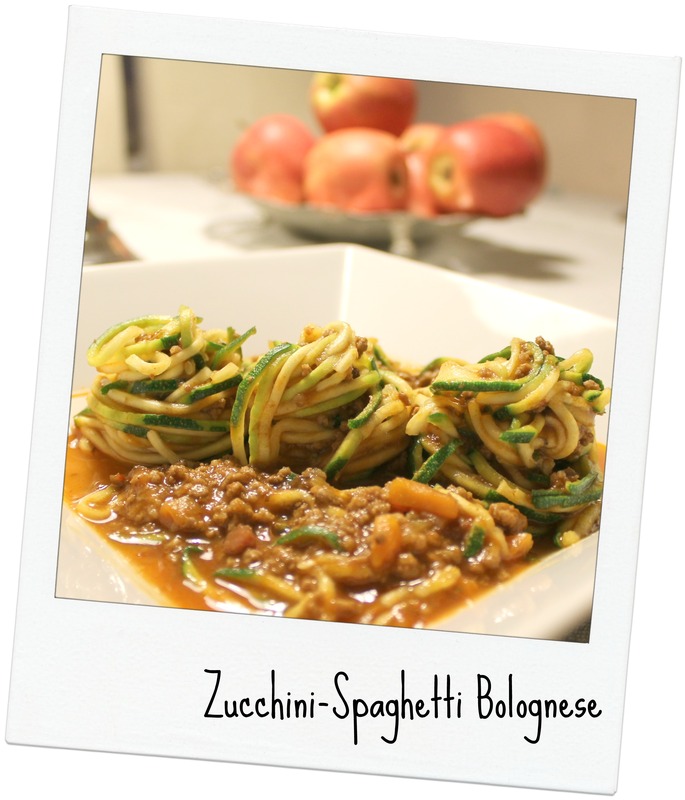 I made zucchini noodles with Bolognese sauce I found in the freezer. The good thing about taking the sauce out of the freezer was that my husband had leftovers to take to work for today. So for today I have nothing but my presentation to do. Tomorrow at work I just need to add some SPSS charts and then I am finished. Hopefully! Why the hell am I doing this again? Ah yeah personal fulfillment and inexhaustible thirst for knowledge. At least I am telling me this over and over again – just kidding – but to be honest this title won’t pay for my further career. At least not in a way I can see now. It’s purely for the cause of the fun. Haha funny…..
Now I am hungry. Let’s see what you ate yesterday. I hope I get tons of food inspiration from you guys! Sorry to hear you aren’t feeling well, I hope you feel better soon! Hopefully all the sleep did you some good! I am drooling at your pancakes and wowzers to that Vegan bar it looks incredible! Thank you so much 🙂 Yeah I got the mug from IKEA years ago and found them in the back of a cabin a few month ago. I can’t believe I never used them before! I hope you feel better soon! It sounds like you have whatever sickness I had last week and I know it’s no fun! Good for you for still cooking and eating healthy meals when you’re sick. I tend to only what carby goodness when I’m not feeling well! Your eats look SO good! I hope you feel better, soon. Thank you so much 🙂 These pancakes certainly were amazing! Hope you get better soon, mon ami!!! At least you had some great food AND made a dent in the presentation! Those Vegan bars look amazing! Thank you, I am really pretty much my usual self again! 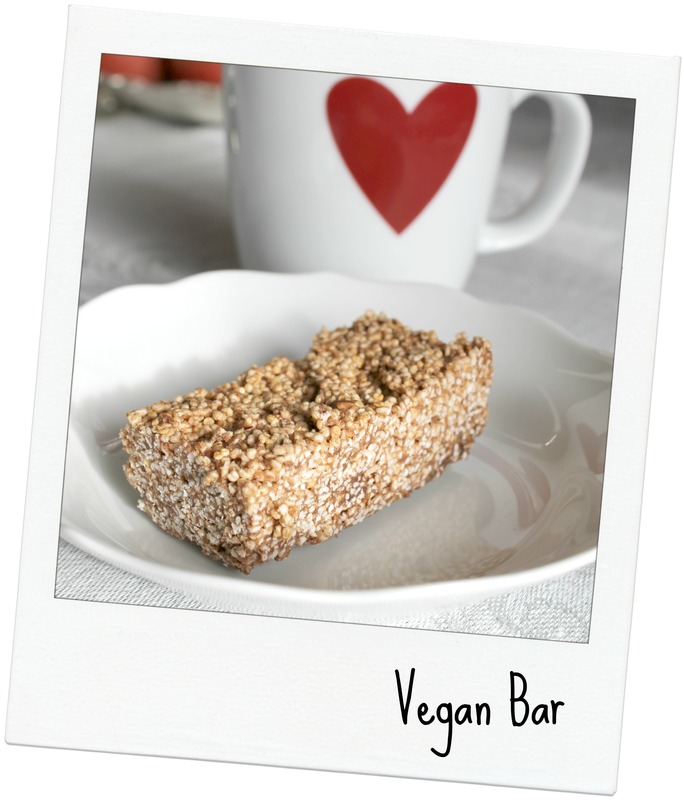 These vegan bars vanished in no time! I can’t believe something that good is also healthy! Oh no! Hope you escaped the cold!